Is Jharkhand's ambitious Aadhaar linkage derailing MGNREGA? Call it the result of clerical oversights or hasty implementation of a programme, a bold initiative by the Jharkhand government to plug corruption and bring about transparency in welfare schemes is backfiring, or at least, so it appears. 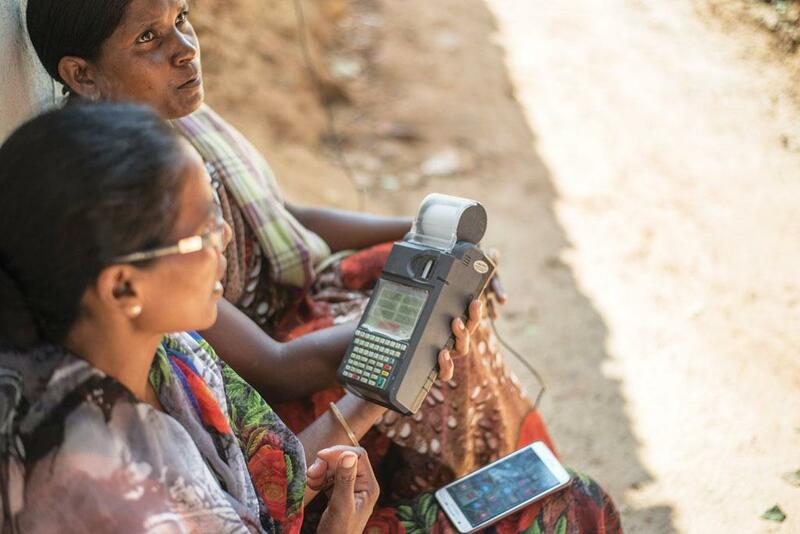 In 2013, Jharkhand became one of the first states to link Aadhaar to the payment under the Mahatma Gandhi National Rural Employment Guarantee Act (MGNREGA). Then its objective was to ensure direct transfer of wages to the beneficiary’s bank account by seeding it with the 12-digit unique identification number on Aadhaar card. This would arrest fund leakages due to identification and authentication errors, such as the existence of duplicate or ghost beneficiaries, which is inherent in welfare schemes. In the past four years, 99 per cent of MGNREGA workers in the state have enrolled themselves for Aadhaar and an equal percentage of workers have opened bank accounts for MGNREGA. These are much higher than the national average—87 per cent MGNREGA workers across the country have bank accounts and 86 per cent have Aadhaar cards. In fact in Jharkhand, the number of workers holding bank accounts has increased from 15 to almost 100 per cent in just one year, says Siddharth Tripa thi, MGNREGA commissioner of the state. Beneficiaries of the scheme and activists working at the grassroots level, however, say the problems are far from over in the state. Many who could earlier benefit from the scheme are now without work or are not receiving wages. Then there are those whose hard-earned money gets deposited in others’ accounts. In Jareya village of Ranchi district, women members of the village self-help group, told Down To Earth (DTE) that most of them have not received wages since opening bank accounts for MGNREGA a few months ago. “When we asked the MGNREGA mate (work supervisor) about the delay, she told us that probably our Aadhaar numbers have not been seeded with our bank accounts and advised us to visit the bank. But going to the bank at Namkum block would mean shelling out at least Rs 40. Who has that kind of money?” asks Meena Devi, who has been waiting for wages for the last two months. Kuldeep Mishra, district resource person of Ramgarh, responsible for conducting social audits under MGNREGA, admits that people are not getting timely wages despite digital transfer. While Mishra does not provide a reason for such delays, village heads and panchayat functionaries say a new set of problems are emerging due to the initiative that was supposed to smoothen the functioning of the scheme. Saraswati Devi, former mukhiya (village head) of Rampur, says several people in the gram panchayat are not able to avail wages under MGNREGA as their bank accounts are yet to be seeded with Aadhaar. “Most people enrolled under the programme are unlettered. So there are a lot of discrepancies in the documents they submit while opening a bank account. One common discrepancy is inconsistent spellings of their names or that of their village. This defeats the seeding process,” says Mahadev Munda, current mukhiya of Rampur. Those who have successfully managed to get their accounts seeded with Aadhaar are also not free from trouble. There is a lot of pressure on operators at the block office who maintain the management information system (MIS) of MGNREGA since the government launched the initiative of linking Aadhaar with MGNREGA, says James Herenj of non-profit Jharkhand NREGA Watch. They often have to work till late hours, and this is resulting in typing mistakes and errors in data entry. In many cases, someone’s Aadhaar number is getting linked to someone else’s bank account. As a result wages are getting credited to wrong accounts, says Herenj. One such irregularity came to the fore at a public hearing of the MGNREGA social audit conducted in Mandu block of Ramgarh district. Sanjay Manjhi from Jobla village claimed that his account has been credited with Rs 11,356 despite the fact that he did not participate in any MGNREGA works. The MIS shows that he has worked for 68 days on a farm pond. The auditor has now ordered an inquiry into the matter and asked the officials to recover the amount from Manjhi. An analysis of MGNREGA fund transfer order of Singhbhum’s Sonua block by DTE shows such irregularities are becoming the norm. In May this year, wages earned by Sukhmati Gope, a resident of Sonua, got credited to the account of Azad Mahila Mandal, a self-help group in the block. That month, the wages earned by another resident Roibari Gope were credi ted to the account of one Purna Gope on three occasions. Herenj highlights another oversight introduced at the stage of updating the MIS. To achieve 100 per cent coverage, the operators at times exclude those workers from the system who do not have Aadhaar cards or are yet to submit those. In the process a lot many workers in need of the welfare scheme get overlooked. Mishra admits that despite the Supreme Court judgement in April this year that Aadhaar is not mandatory for MGNREGA works, only those with Aadhaar cards are getting jobs. State government data shows that till July 2017 bank accounts of only 86 per cent of beneficiaries were seeded with Aadhaar. This means till that month, over 383,000 households in the state were not part of the Aadhaar -MGNREGA link. Munda cites a peculiar problem: several beneficiaries are clueless about the account that receives MGNREGA wages. Since the introduction of Aadhaar-based transfer, most people dependent on government doles have multiple bank accounts, which they have opened under various welfare schemes. For instance, Munda explains, a beneficiary may have MGNREGA account in one bank and a Pradhan Mantri Jan-Dhan Yojana account in another bank. MIS operators run the risk of getting confused and swapping the details of one account with the other. This makes it difficult for people to track their wages. In Ranchi’s Byangdih village, Jeet Munda has accounts at three banks—the Gramin Bank, Bank of India and Cooper ative Bank. Though his MGNREGA account is with Bank of India, the wages kept getting credited to Cooperative Bank for quite a few months. It was only in July that Mahadev Munda helped him identify the correct bank with the help of MGNREGA fund transfer order. Such errors could be inadvertent or deliberate, says Debmalya Nandy who works on MGNREGA in Jharkhand. Since in the new set-up, MIS operators hold a position where corruption can creep in, the government now plans to make them responsible for any irregularity in wage payments, Nandy adds. But will the government be able to keep a tab on banks—the other key player in wage transfer? 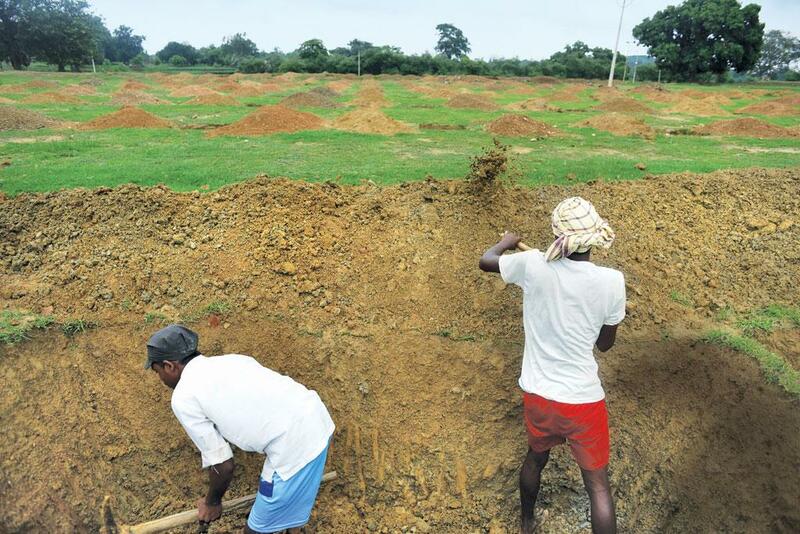 In 2016, ICICI Bank opened MGNREGA accounts for some 6,000 of the 18,000 beneficiaries in East Singhbhum district’s Boram block, but without their knowledge. “One day,” recalls Labakhan Mahato of Bongora village, “the bank officials came to our village and collected our Aadhaar numbers, saying they are opening accounts under the Atal Pension Yojana (a Union government pension scheme for unorganised sector). But since then our wages stopped being credited to our MGNREGA accounts in Bank of India.” While officials at the block office have told him that his wages are now being credited to ICICI Bank, Mahato has no way to confirm this as the nearest branch is in Jamshedpur, 30 km from Boram. Besides, the bank has not given him any passbook, chequebook or ATM card. 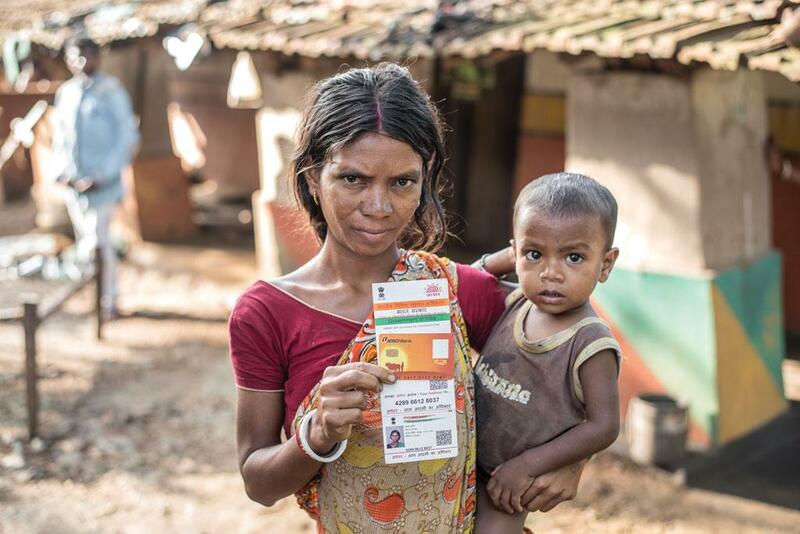 “All they have given us is a biometric card with a number printed on it,” Mahato adds. Using the biometric card, workers can withdraw their wages only from the micro-ATM carried by bank mitra (business correspondents). But social activists in the block say bank mitras rarely visit the area. Even if they do, several workers fail to authen ticate their identity due to calloused fingers or poor internet connectivity in the village. In Bongora, for instance, people walk 5 km to get internet connectivity. Unable to withdraw their rightful dues, several beneficiaries have recently written to the block administration. Block Devel opment Officer Sunil Kumar Prajapati told DTE that ICICI Bank was allowed to take over MGNREGA accounts as it promised on-site payment with micro-ATMs. The MIS roll shows that the money is being transferred to ICICI, but surprisingly workers’ accounts show zero-balance. His administration now plans to initiate an inquiry against ICICI Bank and transfer MGNREGA accounts of aggrieved workers to Bank of India. DTE contacted ICICI bank correspondent Bibek Kumar Sharma, who monitors payments by bank mitras, to understand why the bank has failed to disburse wages. “We do door-to-door payment every day. The block coordinator carries Rs 2-4 lakh cash so that the payment is instant. Micro-ATM ensures that there is no fraud. Only those whose fingerprints do not match fail to avail their wages,” Sharma claims. Problems like fingerprint mismatch, poor internet connectivity and banks lacking enough branches in rural areas have mar red other Aadhaar-linked welfare schemes like the public distribution system. “The government believes that Aadhaar is the only way to curb corruption. Whereas, we need more bank branches, internet conne ctivity and electricity to track money,” says Gurjeet Singh, state coordinator for the social audit under MGNREGA. Agrees development economist Jean Dreze who says the government has kept changing the payment system from post office to cheque to banks. “It has proved problematic for people. The linkage with Aadhaar further complicates the matter. The government has a notion that Aadhar is a magic bullet for corruption,” he adds. Tripathy admits that beneficiaries are facing problems due to poor bank coverage. “We are planning to open cooperative bank branches in every panchayat. In a few days, MGNREGA in Jharkhand will be one of the best implemented programmes,” he adds. Why is Centre making Aadhaar compulsory for poor TB patients despite Supreme Court order? The problems highlighted in this piece are a characteristic of the Indian way of work, riddled with inconsistencies and chaos in general. Blaming the idea of Aadhar and DBT would be unwise in such a scenario, and scrapping the initiatives is definitely not the solution. That Jharkhand has been able to achieve such high levels of enrollment is a case in point that it can be achieved in reasonable periods of time, emphasis should be on reducing errors and improving coordination between various departments and agencies implementing the agenda. The exclusion errors are not born out of design flaws in Aadhar as such, but the lackadaisical approach towards its implementation.